The Swayam group launches, the first of its kind theme restaurant - Ruchi, which means taste. This restaurant specialises in the unusual cuisine of Kerala prepared with the culinary expertise and commitment of their master chefs also from the Kerala region. The decor is traditional ethnic Indian; in fact it hits you in the face the minute you walk in. Enjoy the soothe of a warm and welcoming environment. Swayam Ruchi offers a unique experience in taste and tradition, while you enjoy a naturally healthy meal. You'll discover the fusion of spices, offered through a range of preparations from vegetarian and non-vegetarian dishes, styled through South Indian cuisines. Service is friendly and attentive. Take away service available. With its fresh, aromatic and rich flavour kerala cuisine this 70-seat restaurant brings a new taste experience to Battersea. 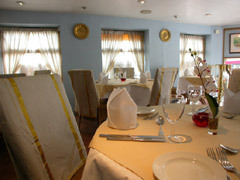 The restaurant can be exclusively hired for private and corporate parties and family get togethers. There is a 30 seat private banquet room perfect for birthdays, hen parties and meetings. The distinctive Kerala cuisine is all about discoveries, aromas and colours. Like most South Indian cuisine, be it seafood or rice and other cereal dishes, the emphasis is on 'healthy food', less use of oil, sugar, and artificial additives, and more use of natural herbs, spices flavourings, and coconut. Most dishes are very hot and spicy and coconut is an integral part of this cuisine. Try the Kerala specialties and look out for their more interesting and unusual dishes.